Straight talking Piers has also hinted in a tweet that he may have another job with a rival TV channel. The GMB Crew have now joined in the ever growing feedback on the host revealing what he is like to work with in a video shared on twitter and it’s none too flattering. Amidst the crew ‘dishing the dirt,’ on working with Piers, the no nonsense host has also hinted that he may be poached by a rival channel. It unfolded on Twitter yesterday when Channel 4 put in a request to the well-known host. Piers took the opportunity to speculate about the message by retweeting it to his followers adding a cheeky comment of his own. “That weird moment when a rival TV network tries to slide into your DMs…. #ShowMeTheMoneyFirst,” he posted. Followers of Piers then took the opportunity to guess which programmes he might be being lined up for. “Probably an invite for Countdown,” one hazarded. “They want you to appear on Naked Attraction,” a third shared. Currently holidaying in America, Piers posted a snap of himself earlier on in the week flying in style en route to Los Angeles as he kicked back to enjoy a glass of bubbles. Fans were quick to notice Piers bitten nails in the picture and commented on this in response to his tweet. el_james74 stated ‘Dude! Why are you biting your nails…! Fan beckymyatt100 is clearly going to miss the absence of Piers in replying: ‘No!!! No point in waking up this week. No GMB with PM! Mocking the host, the clip showed members of the crew looking downcast and unhappy at having to working with Piers Morgan. A sombre voice over announced the troubles of the programme’s staff with images of them looking anxious and stressed by Piers’ behaviour on the morning show in the clip. “These people have children to feed and bills to pay… but they work with Piers Morgan,” it said in a downbeat tone befitting an advert for a charity. “Each day is more difficult than the last,” the video continued to bemoan. The offending tweet was a callout for viewers to vote for the morning TV show at the upcoming National Television Awards. “So please vote to let them know they’re not alone,” it summarised. 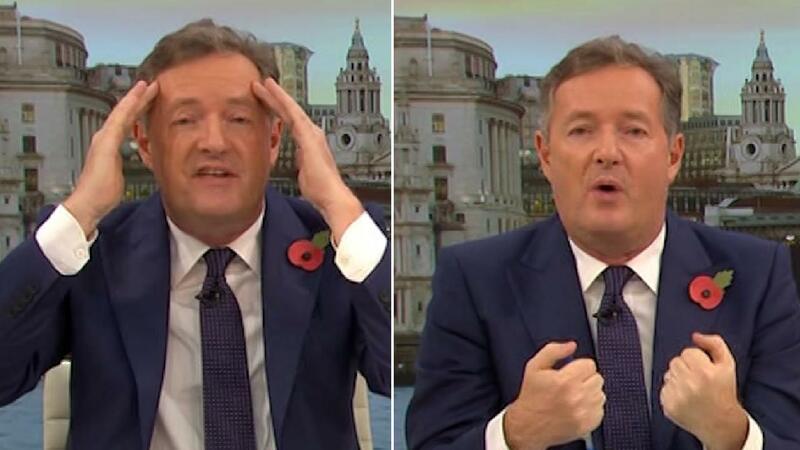 Responses to the video on twitter were mixed with some stating they have voted for the show with others scathing Piers Morgan’s presence on GMB. Rable rouser Morgan retaliated to the cheeky video by saying that he ‘would walk away’ if they continued to make fun of him. Not taking the comical appeal for votes too well, Morgan threatened to cut ties if “any more tweets like this” were posted. Piers’ response provoked a flurry of replies prompting him to act upon his threat of quitting his role. To add insult to injury, his GMB co-host Susanna Reid had a dig at the 53 year old by retweeting a journalist commenting on the original GMB tweet. The leading TV show has been nominated for Most Popular Daytime show, going up against This Morning, Lorraine, BBC Breakfast, Victoria Derbyshire and Loose Women in the longlist among others. Morgan is also a contender for the Best Presenter award but disclosed last week that he doesn’t fancy his chances up against Ant and Dec. This is an urgent appeal on behalf of the team at Good Morning Britain. We have to work with Piers Morgan on a daily basis – each day it gets more difficult.